Back in 2000 I chaired a task group for the Broadband Stakeholders Group (a body lobbying the Government for better broadband connectivity) looking at the probable impact of broadband on the UK workplace. One of the group’s conclusions was that it would have a positive impact on the environment and transport because it would enable workers to do more locally or at home, thereby reducing the need for the daily commute. From 2000 to 2013 I spent much of my life on a tube train across the city, mostly for no good purpose. I stopped that on 9th July 2016 when I left Channel 4 after 13 glorious years. I am now working in a peripatetic style and not only thoroughly enjoying it (and the summer) but actually finding creative inspiration from it. I knew this from the sabbatical I took in 2013-14 to write during which I wrote in all kinds of places from the National Library, Dublin to the kitchen garden of Kenwood – and chronicled it here on Simple Pleasures. As my working week drew to an end yesterday in a steam room near Gray’s Inn followed by a last hour-long burst of writing in some barristers chambers (very productive and clear-minded) I reflected back on a classic week of working on the move which I feel like capturing here for posterity because the working locations were such an inspiration in themselves; reflect the rich mix I plan to make the defining characteristic of my work life going forward; and brought with them such uplifting experiences. in the garden of the Chelsea Arts Club where I met a film-maker whose father knew the protagonist of my movie and from whom I got a useful sense of the kind of person he was. This particular stop brought the highlight of the week as we were joined in the sun-bathed garden by the poet Brian Patten, a charming, witty and warm man from the evidence of this first encounter. In fact it was in a way my second encounter as I saw him perform live in Cambridge around 1984 with his fellow Liverpool poets Roger McGough and Adrian Henri. He gave wise advice concerning my younger son, who has severe dyslexia, and his literary studies. A young priest in exquisitely made robes entered the garden at one point and sat at the adjoining table. At which juncture Brian leaned over the table and recited a brilliant poem about a falling priest, without the faith or courage to fall freely. Brian had based the poem on an ancient Sufi text. It was a beautiful and unexpected gift of words that made my week. in my back garden where I carried on writing the treatment to the tranquil sounds of my newly resurrected water-rock (I can’t possibly use the term ‘water feature’, it’s so Home Front). I copied the water-rock from the courtyard of a hotel in Newry, County Down – it definitely irrigates creativity. in Raymond Buildings, Gray’s Inn in a room with a photo of my lower sixth English class, a reminder of a very inspirational year with a very inspirational teacher (in the photo sporting a velvet jacket). 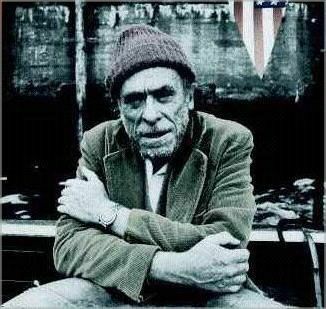 “In 1969, publisher John Martin, founder of Black Sparrow Press, offers Bukowski $100 a month during the rest of his life, in exchange for quitting his job and taking up writing. Bukowski listens and two years later, Bukowski’s first book, Post Office, sees the light. From then on, Bukowski writes voraciously for the next twenty years, until his death. His legacy amounts to thousands of poems, hundreds of short stories and six novels, eventually publishing over 60 books. Quoted from Reach for the Sun, vol. 3 ~ Charles Bukowski’s Selected Letters.